Julie Zantopoulos has read 51 of 100 books. Julie Zantopoulos read 179 books of her goal of 100! Julie Zantopoulos read 223 books of her goal of 100! Julie Zantopoulos read 108 books of her goal of 60! Julie self-published her first book, Shoot Down the Wendy Bird: A Collection of Flash Fiction & Poetry in January 2016 and is currently working on a new adult fantasy novel. She graduated with a degree in Psychology from Cabrini College. If she's not reading she's probably filing, editing, or responding to comments on her quickly growing BookTube channel Pages & Pens (linked in bio). If you are looking for a refined and calm mannered author bio, or BookTube channel, you're in the wrong place. She loves giving colorful commentary and her unique view on books, authors, book hauls, and book tags. Julie's a huge nerd for anything YA Lit, LOTR, and Harry Potter. 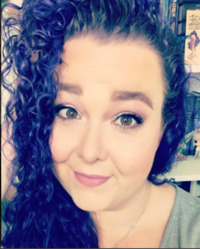 She's got a soft spot for awful SyFy movies (honestly, they're SO bad they're Julie self-published her first book, Shoot Down the Wendy Bird: A Collection of Flash Fiction & Poetry in January 2016 and is currently working on a new adult fantasy novel. She graduated with a degree in Psychology from Cabrini College. Julie's a huge nerd for anything YA Lit, LOTR, and Harry Potter. She's got a soft spot for awful SyFy movies (honestly, they're SO bad they're amazing) and will defend Sharknado until the day she dies. To ask Julie Zantopoulos questions, please sign up. Julie Zantopoulos The best way to combat writer's block is to make it a habit of writing every day. Not every day will produce a masterpiece, or even something…moreThe best way to combat writer's block is to make it a habit of writing every day. Not every day will produce a masterpiece, or even something salvageable, but write anyway. When you skip writing it makes starting up again even harder. I sit down to write every single day, whether it's to work on a short story, a part of my novel, an article for my website, a newsletter, or an email to a friend. If you're writing, you're not blocked. Also, be creative about how you look for inspiration. There are plenty of things that can inspire a story, a character, or a scene in your book that are all around you if you stay observant. Just started subscribed to your channel on YouTube. How refreshing it is to find a BookTuber that is close to my age (although I think I may be a little older than you). Would you ever be interested in doing a buddy read with me some time? When I found booktube midway through 2016 I knew immediately I had found ‘my people’. I felt immediately at home, like “meeting” somebody and just knowing you are going to get along. I am so happy that you feel the same way! My channel started a short 3 months ago and already I have over two thousand book-loving friends and I’m thankful to each and every one of you. "Probably my favorite of Katie O'Neill's graphic novels. So sweet and so important!" We’d love your help. Let us know what’s wrong with this preview of Aquicorn Cove by Katie O'Neill. "I smile every time I think about this. SO GOOD!" Review to come-but this was a good one. "That girl might have magic in her heart, but never forget how much of her power is handed right to her by other people." Imogen is lost and the Grays want her back and so they call for Danny and she listens. Rus Review to come-but this was a good one. Imogen is lost and the Grays want her back and so they call for Danny and she listens. Rush, Hawthorn, June, Lelia, and Imogen are the Grays and Danny may be new to town but she's not new to magic or kissing girls. So, when Danny falls in with the Grays, the local witches that inspire a bit of awe and fear in the locals, she's right at home. All of the Grays are queer in some way, and it's written on the page that they're ace, bi, lesbian, or queer. There are gender and pronoun discussions, discussions about being ace but still enjoying kissing, about not liking being touched, etc. The diversity that is woven into these characters is beautiful and respectful and I adored every single bit of it. "I've waited forever to meet a girl who doesn't treat her body like a natural enemy." Also, can we just be here for girls supporting girls (whether they're romantically linked or not)? The friendships and relationships in this book are pretty phenomenal even if there is a bit of a power imbalance within them. The Grays are using Danny to get their friend back and she's unsure if that means they'll want/need her anymore and still, they all respect one another. I will say that Danny's relationship with her mother was underdeveloped and explained and that really bothered me...but other than that the relationships were A+. "The trees keep us company as we ride. They keep our secrets, and we never have to ask. ...Maybe that's why girls like us are always in the woods." Have I mentioned that the Grays are witches, that they all have their own power, unique and lush and important to the story? That there are a woods that has unnatural storms, hollow treats that Hermits live in, and climbable trees that beg for girls to explore? The setting is lush and beautiful and I was living for it. "I made every choice myself, including the bad ones. Especially the bad ones. Some of those are the choices I'm most proud of." This is not a novel full of whimsical magic but rather dense fog that can transport you, ghosts that can entrap you, and a hunger for power that can lead you down paths you can't venture back from. There is murder and bloodshed, bones and fear and all of it is intoxicating. If you're looking for a feel good, everyone ends up alive and happy novel, this ain't it. However, it is a beautifully written tale of women, love, friendship, and the lengths we go to in order to find our place in the world. "I've found the heart of another secret: the Grays are always touching and kissing each other because so many before us couldn't. Each kiss carries the weight of so many kisses that never were. Every touch is an invisible battle won." We are a read-a-thon that is focused on reading books you already own. Our one year Anniversary is our next and fifth round happening in August 2018. Thanks so much for accepting my friend request! Of course!! Thanks for finding me. Always happy to chat with more bookish friends.